Copyform specialise in the supply and service of photocopiers in Bradford, West Yorkshire and the surrounding areas, with qualified printer engineers covering Bradford, we are able to respond to service calls within 4 hours. 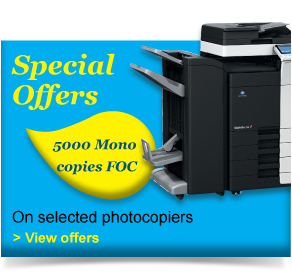 Copyform offer a full range of mono and colour Multi Functional Printers & Photocopiers, We sell and service both Ricoh and Konica Minolta photocopiers. Due to the economic climate we also provide a range of quality refurbished multi functional printers, these can provide significant cost savings when compared to buying new and are fully supported by our maintenance agreement.